Summary: (from the inside flap): Colt as with Julia for a year, but nobody else knew about it. Julia lived on Black Mountain Road in a mansion--with servants--and had a country-club boyfriend to complete the package. Colt definitely didn't come from black Mountain, and no one would have understood why they were together. But it never mattered to them. Until Julia dies in an accident right before her senior year and Colt is suddenly the only one who knows their secret. He tries to pretend that his life is the same as ever, but he's haunted by memories of Julia. Things get worse after the journal she kept about their romance falls into his hands. Colt searches every entry for answers: Did Julia really love him? Was he somehow to blame for her death? But the ultimate question--one nobody can answer--is how he's supposed to get over someone who was never really his to begin with. Review: I like that this book has a male main character so that it will appeal to boys as well as girls. It's a romance, commentary on class divisions, and a discussion of secrets and friendship that will keep high school students reading to the end. I could totally understand Colt's actions and thoughts about Julia: what they had seemed more special because they kept it a secret, but once she died, he had only memories to cling to; he couldn't talk about her with anyone because no one knew the truth. Because of the secrecy Julia gets in the way of him dating other girls and his friendships. I don't think he can really figure out what his relationship with Julia was all about once it's over. 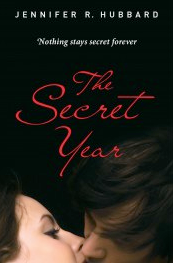 I think anyone who reads this book will think back to a time when they had a relationship with someone that was kept secret (for whatever reason) or even to a secret crush/longing. We all keep secrets, some more powerful and important than others. But, some secrets shouldn't be because they tear at our souls and affect our minds. Great review! This book looks really good and I can't wait to read it. It sounds a little bit like Twenty Boy Summer by Sarah Ockler.